Lou Duva, one of boxing’s most formidable figures as a promoter, manager and trainer in a ring career spanning seven decades, died on Wednesday in Paterson, N.J. He was 94. His death, at St. Joseph’s Hospital, was confirmed by his son Dino, a spokesman, John Cirillo, said. Duva had ties to more than a dozen world champions, among them the heavyweight Evander Holyfield, the middleweight Joey Giardello, the welterweights Meldrick Taylor and Mark Breland and the lightweight and welterweight Pernell Whitaker. He was the patriarch of boxing’s first family in the 1980s and ’90s through Main Events promoters, founded by his son Dan to challenge the powerful Don King and Bob Arum. In a sport known for colorful characters, there was none more gregarious than Lou Duva. The legendary boxing trainer, who developed a number of world champions including Evander Holyfield, died Wednesday at St. Joseph’s Hospital in Paterson, N.J. He was 94. Duva died of natural causes, according to his son Dino Duva, ending more than seven decades of contribution to the Sweet Science. 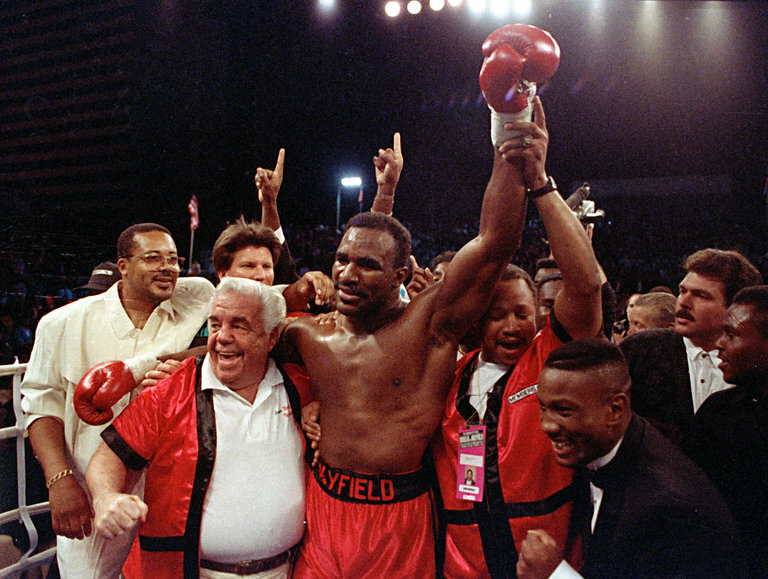 Duva handled the careers of 19 world champions — including Holyfield, Pernell Whitaker and Meldrick Taylor. "The overwhelming number of calls and sympathy wishes from so many friends and associates shows how much our father was loved and respected,” Dino said in a statement. We sincerely appreciate the support from everyone." In boxing there are categories of interest that spark debates from the masses. There's the question of who is the greatest boxer, greatest puncher, best referee and best trainer but there is no debate on who is the best corner man. Wednesday the boxing world lost the greatest corner man ever in Lou Duva who was 94 years old. Lou Duva was hospitalized last week with fluid on the lungs and complications breathing. Things were put in perspective by his son Dino Duva who quietly stated; "He was our father, but he was also larger than life. He accomplished a great deal in business and boxing , but the most important thing to him and what he taught us is the importance of family , it's everything . That's really what he was about, family and fighting for what was right . "Lou treated every young boxer as if he was family. There's a roster of World Champions and who's who that benefitted from having Lou work the corner and gain as much of an advantage that was allowed within the rules. Upon learning the death of Lou, the boxing World was left speechless. Former undisputed Welter weight champion from Brooklyn, Zab "Super" Judah had only two words, "sad day." Man of few words Mark Breland said, "Lou loved Boxing and he loved boxers." "He was our Yogi Berra"
Lou Duva was the quintessential boxing lifer: Gruff, hard-boiled on the outside and lovable and caring on the inside. The legendary boxing cornerman/manager, who was the patriarch of the boxing family that turned Main Events into one of the sport’s most successful promoters, died Wednesday at 94 of natural causes, according to his son, Dino. Duva, who spent more than 70 years in boxing is a 1998 inductee into the International Boxing Hall of Fame. His son, Dan Duva, died of cancer in 1996 at just 44 and followed his father into the Hall of Fame in 2003. When Dan Duva was alive, he would promote the shows along with his wife, Kathy, and his brother, Dino, while Lou often managed and worked the corner of several of the boxers on the show. Lou Duva, the beloved International Boxing Hall of Fame manager and trainer who worked with 19 world titleholders and had about a million stories from his roughly 70 years of involvement in the sport, died on Wednesday of natural causes at a hospital in his hometown of Paterson, New Jersey. He was 94. Duva was also the patriarch of the boxing family that founded Main Events, which became one of the most dominant promoters of the past 30 years. Duva's death was announced by his son, Dino Duva, who has been involved in the promotional end of boxing for decades and is an executive with Roc Nation Sports' boxing division.